US, 1952, 100 minutes, Colour. 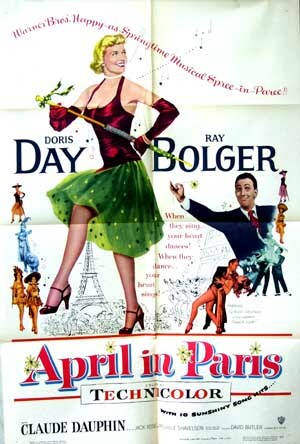 Doris Day, Ray Bolger, Claude Dauphin, Eve Miller. Doris Day is at her brightest in this film. She is matched with Ray Bolger, the Scarecrow from The Wizard of Oz, who did not make many film appearances. (At this time he was Charley's Aunt in the musical, Where's Charley?). Bolger is an excellent comedian, as well as fine artistic, tap and acrobatic dancer. He has some good opportunities in this film. However, as a credible romantic lead to Doris Day, he defies credibility a little. Claude Dauphin leads the supporting-cast, seeming to enjoy himself in the role of a French nightclub owner and with the possibility of song and dance. The film pokes some fun at America in the '50s, culture, art, snobbery. Light but entertaining with the stars at their best. 1. Enjoyable musical? Piece of Americana? '50s style? 2. Warner Bros. production, colour photography? Sets, staging of the musical numbers? The Paris sequences? The musical score, the title song and the various renditions? New songs, performances, the dance in the kitchen? Romantic songs? 3. The title, the traditional song? America and France? Ethel's ambitions? 4. The focus on Winthrop, the poking fun at the bureaucracy in Washington, his position and title, the associate workers and their respect? The planning of the festival? His fussiness? The mistaken letters, the hurry to New York, the press pursuing him, going to the theatre, attracted to Ethel, the cake, telling her the bad news, his return, everybody's compliments, persuading Ethel to go? The stuffiness on shipboard? His wanting to break loose? The toasts, the song and dance? In love with Ethel, the marriage ceremony? Off the boat, his prospective father-in-law, his fiancee? The tangles, the opening of the festival, the fight? Going to the nightclub? The emergence of the truth, his apologies to Ethel, the happy ending? 5. Ethel, the chorus girl, tough and lively, performance, the chance of a lifetime, going to Paris, the speech and the party, the bad news, her reaction, tricking Winthrop and her going to Paris? The stuffy meal, going to the dance, with Philippe, in the kitchen, in love with Winthrop, the comedy about the cabins, the marriage, their being prevented from being man and wife? The bad news, the clashes with the fiancee, the festival, the fight? Her performance in the nightclub? Making Winthrop jealous, the happy ending? 6. Philippe, his problems in America, money, diplomacy, on the boat, the cook, the advice to the Bostonians and the Americans, the dance in the kitchen, the wedding ceremony, looking after Ethel? The man-about-town, the nightclub? The humour of his wife and family? 7. American bureaucrats, stuffiness and ambition, the fiancee wanting to be the First Lady, her controlling Winthrop?, On the boat, the highbrow artists and their reactions to the chorus girl? The festival and the fiasco? 8. The captain, the cook, the personnel on the ship? The festival? 9. Comedy routines, musical numbers, an artificial entertainment - but entertaining?